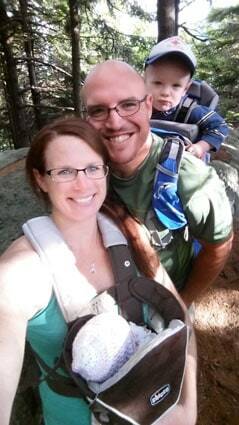 Amy Laramie hikes with husband Justin, son Aengus and daughter Brooke. Editor’s Note: This is part of a series on graduates of Green Mountain College’s Killington School of Resort Management (KSRM) program, the nation’s only three-year bachelor’s degree program in resort and hospitality management. Amy Laramie was born and raised in Jefferson, N.J., and thanks to her father who skied, she learned to ski at age 5 and later snowboard while attending Pope John XXIII High School. During high school, she began her career as a snowboard instructor at Mountain Creek Resort. She began looking into college resort management and hospitality programs and soon she came across the GMC program. In 2007, she transferred to GMC and the KSRM program in Killington. Mountain Times: What’s different about the GMC program? Amy Laramie: It’s not your traditional college program. You live in Killington [at the school’s location on Killington Road] and take classes here, not on a college campus. You apply what you learn in the classroom through hands-on experiences at a real ski resort! With small class sizes and professors being upper management staff at the resort, you are extremely engaged in what goes on at the mountain. MT: What departments did you work in during the winter term? AL: Throughout my career at Killington I have worked in retail, serving banquets and at the Wobbly Barn where I did my co-op I and II (during the winter terms). When I worked at the Wobbly, I did both front of the house positions and back of the house. This enabled me to understand all aspects of the operation from guest expectations and service to food prep, inventory, budgets, etcetera. AL: I graduated in 2009 and applied to Killington and began working as the conference and wedding sales coordinator, then was the sales representative. I was then approached to apply for a position opening up soon as the executive coordinator, providing support to the resort president and the director of marketing and worked in that position from September 2012 to July 2015. Being in that role you learn a lot. You are the hub of the marketing, sales and events team. Not only did I monitor each of their budgets and process invoices, but I also assisted with various special projects throughout the entire season. Just recently I received another promotion as the internal communications and guest experience manager. I am coming up with strategies to better internal communications amongst the company and interdepartmentally. We have a lot of seasonal and full-time staff who work on mountain and do not have access to a company computer. We are a big resort with a lot of information to learn. We cannot expect everyone to know everything but we can certainly try. For the guests I will be focusing on core guests (season pass holders, 100 Day club etcetera) as well as analyzing survey feedback from all our guests and adding the more personal touches and creating joy to the guests’ vacations. MT: How do you juggle full-time work and family and the challenges they entail? AL: I have a great daycare in Rutland where my kids go Monday to Friday. Having two kids does limit me with the amount of time I can be physically in the office, but I am able to continue work in the evening at home after the kids have gone to bed. My husband helps out watching the kids on weekends when I am at the mountain team supporting – they can also go to the Killington daycare and will begin to learn how to ski at the age of 2! Working at a resort where people vacation can be tough around the holidays as we are open for business and that can limit the amount of family time you get. But the benefit of working with great people and having this amazing mountain in my background is a great benefit! MT: And the key to your managing both work and family? AL: You have to be organized! Getting two little kids out of the house and two dogs fed every morning can be quite challenging. I do a lot of prep work the night before, but no matter how much planning you do you have to be flexible with little ones – just like at a resort. There are some situations (like the weather) that you just cannot control. Some may stress with constant changes and not knowing what could be coming at you next, but I love the new challenges that changes bring! MT: How does the mountain lifestyle fit in with family life? AL: I love the outdoors, as does my husband. We take the kids on adventures as much as we can — a week after I had my daughter we were already hiking up Deer Leap! We also go snowshoeing, fishing, swimming, picnicking at the Cooler in Mountains Concerts — I couldn’t ask for anything better. MT: Do you have any advice for students looking into college or who should consider GMC/KSRM program? AL: Anyone who has a passion for winter sports should give the college a try. Because of the GMC/KRSM program, I found a job that I enjoy walking into every day.